The March 2019 Rural Mainstreet Index (RMI) has moved to the highest level since December 2018, showing above-neutral growth for the rural economy. The monthly survey of bank CEOs in a 10-state Midwest region increased to 52.9 for this month. In February, the index was 50.2. March marks the 11th time in the past 12 months the index has been above the growth-neutral rating of 50. “Our surveys over the last several months indicate the Rural Mainstreet economy is expanding outside of agriculture. However, the negative impacts of tariffs and low agriculture commodity prices continue to weaken the farm sector,” says Ernie Goss, who chairs Creighton’s Heider College of Business and leads the RMI. 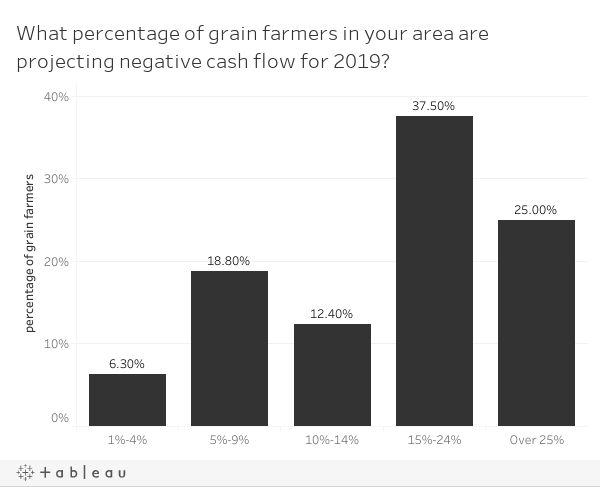 Bankers were asked to estimate the percentage of grain farmers in their area that were projecting negative cash flow for 2019. On average, bankers expect 18% of grain farmers to experience expenses to exceed revenue for 2019. This is 1% higher than last March’s results when the same question was asked. However, strong yields and last year's market facilitation payments on soybeans have slowed the financial decline, Kuhlmeier added. The No. 1 reaction by bankers to help financially stressed farmers was restructuring loans, according to nearly 83% of responding bankers. Another 14% indicated farmers were slow paying their loans and 3% reported financially stressed farmers selling the farm to more economically viable farm operators. The confidence index, which reflects bank CEO expectations for the economy six months, fell to a low 45.7 from February’s 48.5, indicating a pessimistic economic outlook among bankers. “March floods, tariffs, trade tensions and anemic farm income negatively influenced the economic outlook of bank CEOs,” Goss says. The farmland and ranchland-price index for March slumped to 36.4 from February’s 42.2. This is the 64th straight month the index has fallen below 50. 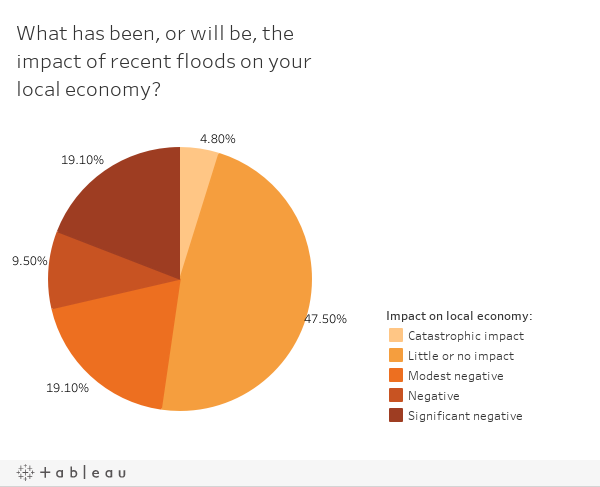 A large share of survey responses occurred before most of the negative impacts of the recent floods became widely known. Here's how bankers rate the flooding impacts. The RMI represents an early snapshot of the economy of rural agricultural and energy-dependent portions of the nation. It covers 10 regional states, focusing on 200 rural communities with an average population of 1,300. Mark, You guys need to remember all you are producing is animal feed or grain for ethanol which there is to much of. Our Land Grant Universities have sold you on the word MORE! This will solve all your financial problems. Seed, fertilizer, chemical company’s and the good old coops all make millions or billions off selling you guys on the word MORE! Time to get smart, produce what tour true customers want and go away from over produced commodities that nobody needs or you will be forced out! Rose, You are wrong saying noby cares, people care more now than ever before about the food they eat and the food they feed their families! Consumers have gotten a lot smarter than you conventional producers. They want nutritional, healthy food. You are producing food that nobody wants, either get smart or you will be out! MOFGA! Good luck with that, eh?